It’s been very cold these last few days although bright and sunny overhead. After a bracing walk along the beach at St Andrews – think opening sequence of Chariots of Fire, without the running of course – I thought it was time for another Studio Conversation. 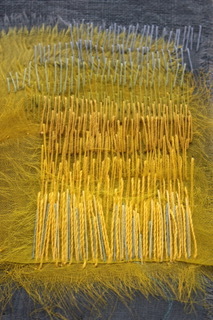 I was very excited to have the chance to talk with Ruth Issett at a recent Textile Study Group weekend. 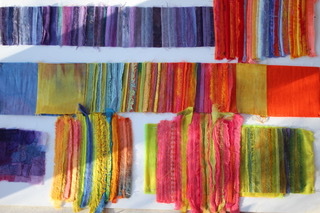 Ruth is a member of Prism and Textile Study Group and has exhibited widely with both groups. 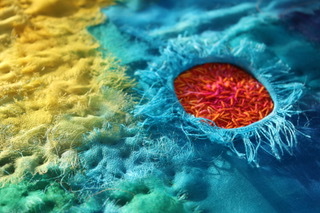 She is very well known through her teaching, books and has an international reputation as a textile artist. I first met Ruth at a Scottish Embroiderers’ Guild Summer School but she taught the City & Guilds textile courses for many years and can often be found on the Art van Go ‘Artist in Action’ stand at the annual Knitting & Stitching shows so she has huge teaching experience. 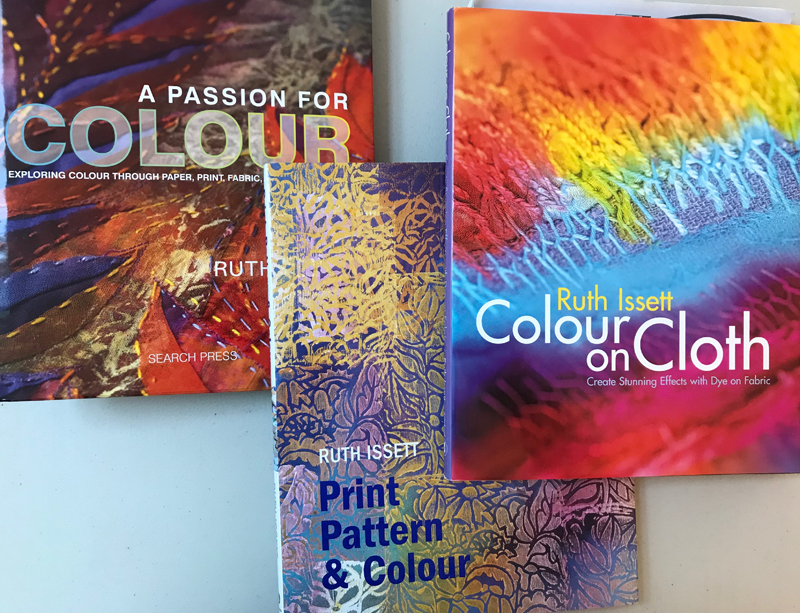 Over the years I have acquired several of her books and one title in particular seems to sum up Ruth’s work – A Passion for Colour. It was this passion that I wanted to hear about and so I started by saying to Ruth – everyone knows you for the vibrant use of colour, has this always been a feature of your work? I have two early memories of colour, – one was the delight of using a paint box, probably my mother’s watercolour set, at the kitchen table on a wet afternoon. To have access to pure colour and the chance to apply it with a brush onto paper, such liberation! The other was choosing 3 very small balls of wool to use for sewing and finding it very difficult to choose just three colours! I have always been attracted to colour and particularly love combinations that have some life to them. I like to create colour schemes that vibrate, pulsate and buzz but I also love rich, subtle, calming combinations that many may not associate with my work. What are your favourite materials and processes? Let me look at processes first. I prefer to manufacture my own colour. I tend to apply dye, print, paint and use other media directly to a surface. I do some immersion dyeing but prefer to directly paint dye onto a selected fabric or paper. I use printing – block, screen, mono print, roller, – directly onto paper and fabric, to build dyed and printed surfaces as well as to develop ideas. I am fascinated by the creation of colour combinations using different processes and techniques. Printing gives the opportunity to explore the use of opaque colour placed onto coloured surfaces and then can be overlaid with further transparent colour. This can give vibrant contrasts or subtle nuances of colour. 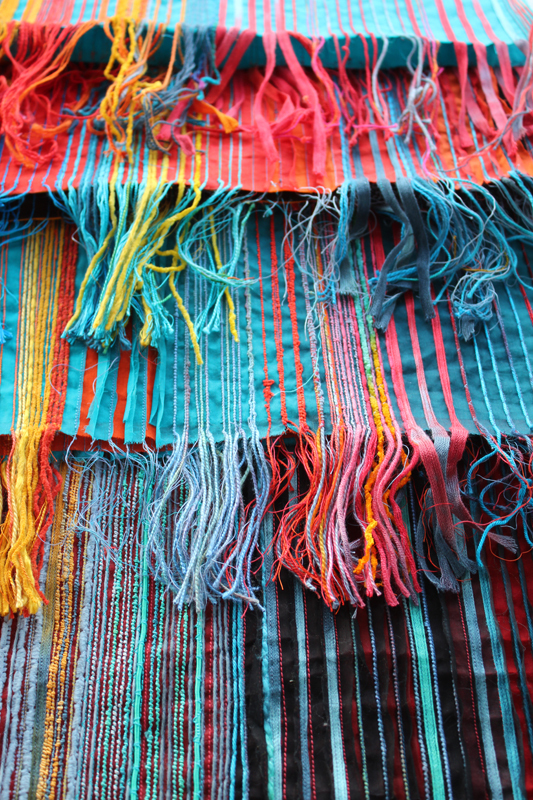 I like to see how the colour responds to a variety of fibres and weaves. I select various plant based materials – cottons, linen, bamboo or mixtures with silks as well as man made fibres such as viscose and rayon. I will use these materials in a various ways, often layering them together. I use a variety of weights of fabric and paper. I like to use medium weight cartridge paper, Khadi cotton rag paper as well as Abaca tissue and delicate Lokta papers. 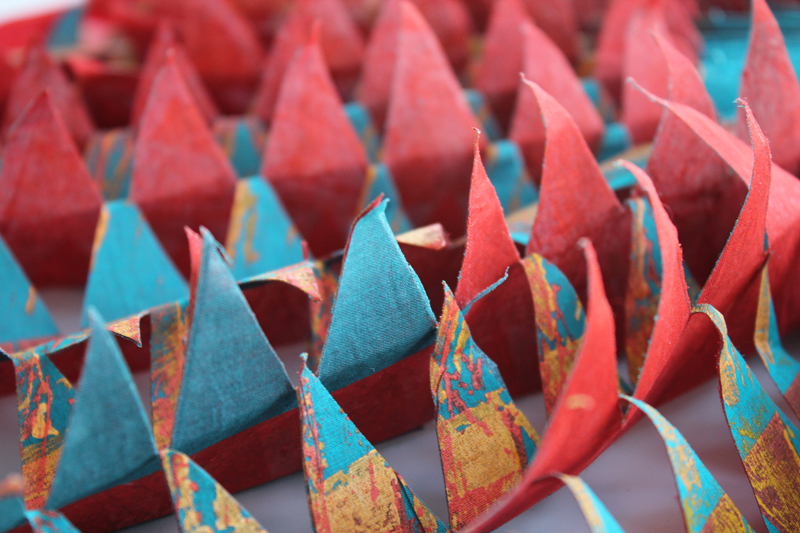 The difference between handmade papers and commercially produced paper emphasises the paper surface, texture and colour absorption. I enjoy working with dyes onto these papers as the clarity and intensity of the colour is so rewarding! 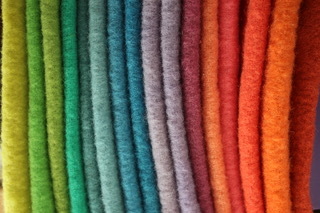 A recent collection of dyed wool blankets that Ruth is now using to produce a series of colourful cushions. This is just a small collection of the colours prepared. The fabrics I select are comparatively limited, but I find these give me an excellent variety of colour quality as well as texture and surface. I select cotton organdie, silk organza, silk crepeline, silk chiffon, silk georgette that all give variations in translucency and transparency. I also select some heavier fabrics such as old linens, wild silk and silk noil, and then there is Viscose Satin, which is such a luscious fabric when dyed.. and on and on! I use differing combinations of cloth when working sometimes just working with one fabric such as cotton organdie – dyeing, printing and stitching it. Other times I will layer and combine different fabrics to create rich varying surfaces and then add additional colour and detail with simple hand stitch or areas of machine stitch. It is very dependent on the particular project and the scale. Part of a series of three for Prism exhibition in 2016 – exploring the possibilities of layering and also working below the surface of the fabric by opening it up to reveal other layers. Can you describe your studio? Do you like to work with the radio on or music playing or do you prefer to work in silence? I am incredibly lucky to have a two storey studio next to our home. It was a wonderful bonus when we moved here. It has a ‘wet’ studio downstairs, with space for a print table as well as two ample sinks. Upstairs, we use as an office and ‘dry’ area for design, drawing and stitch. This area has floor to ceiling windows on two aspects and a small wood burner, which makes it very comfortable when sitting working. I often work in silence, but when I am into some repetitive work, I might listen to music or to ‘catch up’ programmes. Downstairs when I am producing lengths of fabric or dyeing I will often have lively background music to keep me going and give me extra energy! Many people are tentative about drawing – how do you approach the design phase? Do you work in sketchbooks or on a larger scale, or a mix of the two? I use a variety of methods, but drawing using a graphite pencil isn’t always my starting point. I will ‘draw’ using different media often simple mono printed marks or drawings or even drawing with a print roller making big marks, to free me up. I explore ideas using a variety of print techniques onto a variety of papers, these can then be enhanced and developed with layers of different media. Once the ideas are forming I may add extra layers of drawing with coloured pencils or pastel to give detaiI do use sketch books, I have a number in use simultaneously. Some I work into directly, others I use as a reference resource, details of work such as measurements, materials and plans. I will often compile design ideas into a sketch book, it is a way of collating and sorting for me. As I use a lot of water based media, I don’t want to wait to turn the page. I also have a collection of small sketch books that record fabrics and dye colour combinations. I have found this is my best way of filing and recording ideas and specific details of processes. Occasionally I look at old sketch books from 20 + years ago and I can see how my ideas have developed over the years, there are some ideas I am still exploring and others that I have now discarded! 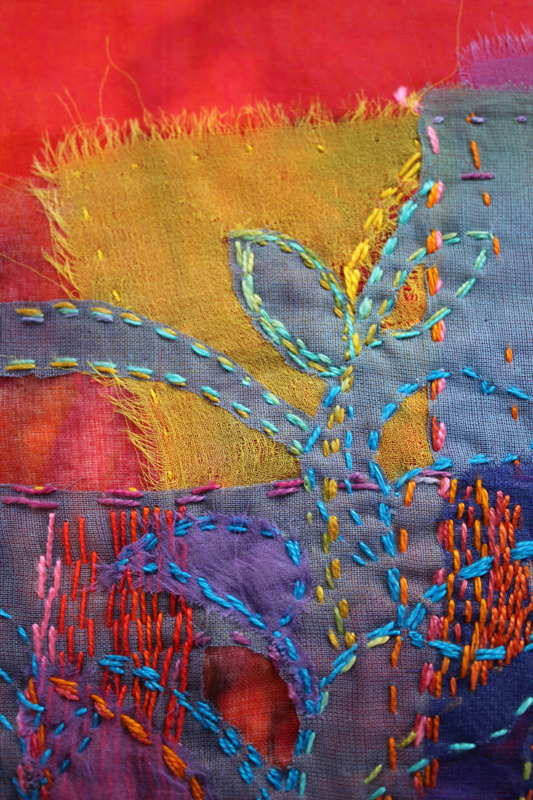 Piece worked with multiple layers, stitched and cut back, exploring a number of different running stitch ideas, developed from looking at Kantha. How do you gather information; do you have a regular drawing habit and do you use photography to take visual notes? I often start with a response to a challenge or a project, or a collaboration with a colleague or the rest of the Textile Study Group. This might be in the form of notes or a collection of work created as described before using print, inks and drawing or collage. I do collect photographic images as a quick record of a particular moment, – the light at different moments, casting shadows, or a stormy day and a strange light quality before or after a thunderstorm. I much prefer to record with paint but often that is not possible at that particular moment! Quite often I will develop ideas when I am working with a specific group of students and I want to focus on some specific process or concept, that can be fun and challenging at the same time! There is a strong commitment to teaching within the Textile Study Group – how important is teaching to your practice? Teaching, tutoring and mentoring is very much part of my work. I love sharing ideas with students, – dropping a pebble in a pool and seeing where the ripples go! I am gradually changing my teaching commitments, less process led and much more specifically focused to more developmental work. I like the challenge of trying to find ways of problem solving, not only with design but also in the making of work. You explored climate change in the work you produced for DIS/rupt but do you have recurring themes as inspiration? Not necessarily, although I suspect how I express myself is very centred around the selection of colour and the quality of that colour and how I use it to express ideas and communicate. For DIS/rupt I wanted to convey the feeling of being out of control particularly when thinking about climate change, the enormity of this is challenging for the world. I expressed it with strong strident colours that moved and vibrated within the work and also when displayed. Whether the audience understood that I don’t know…. Recently I created a series of three pieces all reflecting observed colour, qualities of light seen and recorded from my studio. Last year I produced a number of pieces using colour studies from early spring/summer here in Shropshire. I am constantly recording and exploring the quality and variations of colour, how it is affected by the fabric, or the colouring medium or surface. I am never short of things to research and explore. What plans do you have for the next few months? I have a couple of substantial projects to work on so I am trying to keep some time to myself to spend in the studio. It is surprising how quickly time gets eroded by teaching commitments but I do enjoy that. I have some regular teaching here in Shropshire, which is very good. I also have a summer school in France to look forward too and then a few workshops around the country! I do need to use this wonderful space, it is such a luxury and I am so lucky with so many opportunities to be involved with! That’s been fascinating Ruth and I know will be of great interest to readers; thank you for sparing the time in a busy weekend and I look forward to seeing you at the next Textile Study Group weekend. You can see more of Ruth’s work on the Textile Study Group website at this link but her books are widely available and a must-have if you are interested to try colouring fabric for your own projects.